As a member of the International Coalition of Art Deco Societies we want to alert our fellow Deco enthusiasts that the unique Art Deco interiors of Paris’s Union Libérale Israélite de France (ULIF)––sometimes called the rue Copernic synagogue––are in danger of being lost forever! Renovation plans threaten both the façade and the interior of this historic building and the public is encouraging the developers to pursue restoration over complete renovation. Sign the below petition today to help protect these Art Deco interiors. Based on the recent press release from the Waldorf Astoria Hotel and Spa regarding the upcoming restoration of the landmark building’s interior spaces, the information presented shows a few renderings of the interior spaces, however there is no information on the restoration approach for these significant interiors. ADSNY recognizes two exceptional firms (SOM and Pierre-Yves Rochon) comprise the design team for the project and we look forward to more information on their conservation, preservation and restoration approach moving forward as the design process unfolds. Click here to see the Anyang’s full press release and a few renderings. The Verdict is in on the Waldorf! We are delighted to announce that all of the Waldorf Astoria interiors that were proposed for Landmark designation were unanimously approved by the New York Landmarks Preservation Commission today. The designation protects all fixtures and interior components of these spaces, which may include but are not limited to the wall surfaces, ceiling surfaces and floor surfaces, murals, mirrors, chandeliers, lighting fixtures, attached furnishings, doors, exterior elevator doors and grilles, railings and balustrades, decorative metalwork and attached decorative elements. To see the LPC’s full statement click here. We offer our sincere thanks to everyone, and every organization, from around the world that helped in this preservation campaign to protect the irreplaceable Art Deco interiors of the Waldorf Astoria hotel. This was a true group effort and without your help, this would not have been possible. LPC to consider the Waldorf’s interiors! The NYC Landmarks Preservation Commission has unanimously voted in favor of setting a public hearing for the interior spaces of the Waldorf Astoria Hotel for landmark designation. Many thanks to those of you who contacted the LPC making your case for landmark designation of these important interiors. This would not have happened without the outpouring of support that the Waldorf received from individuals around the world. Now that a public hearing will be scheduled, your voice is even more important! Sign our online petition today to ensure that the public interiors of the Waldorf are protected. Regardless of where you live, your voice matters. You don’t have to be a New Yorker to help save the Art Deco grandeur of the Waldorf. Please encourage everyone you know, wherever they may live, to sign the petition now. On Thursday, October 6th, ADSNY’s Director of Operations, Meghan Weatherby, and Historic Districts Council’s Executive Director, Simeon Bankoff, led Travel + Leisure on a tour of the wonderful Waldorf Astoria interiors that are worthy of Landmarks designation. Luckily the tour was broadcast live through Facebook so everyone had a chance to enjoy the tour! ▪ Click here to ACT NOW! We must continue our campaign for interior designation! Although this is a step in the right direction, it in no way ensures the preservation of the iconic Waldorf interiors. Anbang is required to share all of their renovation plans with the LPC as a protective measure set forth by the building’s exterior landmark status. So it is important to understand that Anbang’s latest statement is only abiding by the laws set in place by the buildings exterior designation. The only way to insure preservation of the important interiors is through LPC calendaring a public hearing. So, we must continue our outcry! The only real way to make sure Anbang works “cooperatively and collaboratively with the Landmarks Preservation Commission” is to Landmark these wonderful Deco public spaces. The Waldorf still needs your help, so keep sending LPC Commissioner Meenakshi Srinivasan messages on the importance of the Waldorf to New York’s history! On Tuesday, September 27th over 300 Art Deco and preservation advocates joined ADSNY and the Historic Districts Council to explore the public interior spaces of the Waldorf Astoria that are worthy of Landmarks Designation. These spaces include the East Gallery, Central Lobby, Peacock Alley, Park Avenue Lobby, Grand Ballroom, Silver Corridor, Basildon Room, Jade Room, Astor Gallery, and of course the Starlight Roof. With such a large crowd, we quickly attracted the attention of security, who unfortunately rendered the 3rd and 18th floors inaccessible to our tour-goers. Coincidentally, while we attempted to appreciate the Waldorf’s Deco splendor, the new owners cordoned off the spectacular Park Avenue Lobby to celebrate the hotel’s 85th anniversary…and no, preservationists weren’t invited! While we had no prior knowledge of this event, it was important that our presence was felt, as it sent a clear message that New Yorkers want to see these lush interiors preserved for another 85 years. For those of you who would like to experience the Waldorf interiors before it’s too late, click on the preview below to print your own copy of our self-guided tour. We’re making steps in the right direction but the fight to save the Waldorf isn’t over yet! After their meeting with the New York Landmarks Commission, where Anbang said they oppose ANY landmark designation for the Waldorf interiors, they have now issued a new statement! Although their new statement is a step in the right direction, the only way to insure Anbang works “cooperatively and collaboratively with the Landmarks Preservation Commission” is to Landmark these wonderful Deco public spaces. The Waldorf still needs your help so make sure to keep sending Meenakshi Srinivasan messages on how important the Waldorf is to New York’s history! The New York Landmarks Conservancy met with Anbang Insurance Group, the new owners of the Waldorf, to discuss the company’s plan for the future of the Waldorf Astoria. Though Anbang said they appreciate the historic character of the building and that they know how much the hotel means to New Yorkers, they oppose ANY interior landmark designation that would protect the important public spaces. The Conservancy has sent their research describing the artistic, cultural, and historic significance of the Waldorf’s public interior spaces to both Anbang and to the Chair of the Landmarks Preservation Commission. ADSNY is very concerned about the future of the great Art Deco interiors of the Waldorf and are continuing our efforts to urge the Landmarks Preservation Commission to calendar and designate the great public rooms! Act now to help the Art Deco Society of New York save the interior spaces of the Waldorf Astoria before it’s too late! We are distressed to learn that the world’s preeminent Art Deco hotel will be gutted and turned into condos and fear that the lobby, entrances, Louis Rigal murals, and other great public spaces, such as the Grand Ballroom, will be destroyed. We need your help immediately to convince the Landmarks Preservation Commission to act quickly to calendar and designate the public interior spaces of the iconic Art Deco masterpiece, the Waldorf Astoria Hotel. This week The Wall Street Journal article, “Classic Waldorf Hotel to Be Gutted, Up to 1,100 Rooms Turned Into Condos,” reported that the Waldorf-Astoria interiors are in jeopardy. You can fead the full article below. NEW YORK, NY – The Historic Districts Council (HDC) will present its annual Grassroots Preservation Awards to five organizations and individuals on Tuesday, May 24, 2016 at Saint Mark’s Church in-the-Bowery, 131 East 10th Street, New York, NY 10003. Every year, HDC, the citywide advocate for New York’s historic neighborhoods, honors and celebrates the activists and groups who work to preserve New York City’s historic neighborhoods. The event is open to the public at a cost of $30 ($20 for Friends of HDC). Community sponsorships for the event are also available. To purchase sponsorships, please call 212-614-9107 or e-mail hdc@hdc.org. Individual tickets will be sold at the door. The event begins at 6:00pm, followed by a reception. For more information, go to www.hdc.org or call 212-614-9107. These handsome horses from the Coney Island Pumping Station are on loan to the Brooklyn Museum. Coney’s Ponies are in exile. They have been since 1981. Preservation advocates vow to bring them home again — despite a setback handed them by the city Landmarks Preservation Commission (LPC). The ponies are Art Deco-style statues of Pegasus, the winged steed, attributed to artist Harry Lowe and carved out of limestone in 1934. There are four pairs of ponies. The handsome horses’ home is the Coney Island Pumping Station at 2301 Neptune Ave. Or it was. But nobody in the neighborhood has seen them in three and a half decades, unless they’ve trekked to the Brooklyn Museum in Prospect Heights, where the winged beasts are on loan. The fine equine artworks are corralled in a brick plaza surrounded by a parking lot behind the museum. This is the full set of Pegasus sculptures from the Coney Island Pumping Station, on display outside the Brooklyn Museum. Until they were moved because of vandalism, Coney’s Ponies stood proudly outside the pumping station, a streamlined Art Moderne facility that opened in 1938 and was used to boost city firefighters’ water pressure. The lozenge-shaped building on the shore of Coney Island Creek and the corner of W. 23rd Street was decommissioned as a fire pumping station in 1976. Its owner, the City of New York, has shamefully neglected it. The long-vacant property, whose grounds are used for a community garden, had been on the LPC’s calendar for landmark designation consideration since 1980. On Feb. 23, the commissioners tossed it off their calendar. Unless the pumping station is renovated, Coney’s Ponies are never coming home. We visited the winged horses recently and snapped photos to share with Coney Island residents. The LPC’s vote was part of its intensive process of clearing up Backlog95 — a list of 95 historic sites throughout the five boroughs that had been languishing in limbo on the commission’s calendar for as long as 50 years. The LPC rejected the pumping station despite passionate spoken and written testimony in favor of landmarking and adaptively reusing it, which was offered at an October LPC public hearing. Dozens of community residents, architects and preservationists pleaded its case — including former state Assemblywoman Adele Cohen (D-Coney Island, Bay Ridge). “Southern Brooklyn has long been overlooked — perhaps one could say neglected by institutions such as yours. Now is the time to start making amends,” Cohen wrote to the LPC. The Art Deco Society of New York delivered a pro-landmarking petition with 371 signatures. The LPC’s February decalendaring vote surprised preservationists. “We went to that meeting with high hopes,” she said. The Coney Island Pumping Station is the only public building designed by the late Irwin Chanin, who is known for his monumental Century and Majestic apartment houses on the Upper West Side and the Chanin Building, a distinctive office tower near Grand Central Terminal. “They’re not going to build another Irwin Chanin building. It’s worthy of preservation at a lot of different levels,” Nusim said of the pumping station. Here’s a closer look at a pair of Coney’s Ponies in exile. “We were depressed when we first heard the news [about the decalendaring] because of the great effort everyone had made, but now we are refocused on turning this into a success story,” Nusim said. Her organization will press for adaptive reuse for the pumping station. The society’s preservation committee will be in charge of the effort, which will get going in the spring. A Horse Is A Horse, Of Course, Of Course — outside the Brooklyn Museum. As for the horse sculptures, they were not a permanent gift to the Brooklyn Museum. They could be returned to the pumping station if it is renovated and reused. However, the horses have a real home waiting for them: “They belong by Coney Island Creek,” she said. This is the long-vacant Coney Island Pumping Station, the horse sculptures’ original home.This is the long-vacant Coney Island Pumping Station, the horse sculptures’ original home. ADSNY wants to thank you for your invaluable efforts in helping to raise awareness of the cultural importance and stylistic merits of the Coney Island Pumping Station. While the Landmarks Preservation Commission has voted against landmarking the Pumping Station this calendar year, we are encouraged to continue our campaign. “We did receive a lot of support in terms of designating this building,” said L.P.C. chairwoman Meenakshi Srinivasan “…that’s the reason why we are not voting on it being taken off the calendar on the basis of merit. Maybe at some point in time it could be restored,” she continued. The Commission encouraged the community to find adaptive reuse of the building. 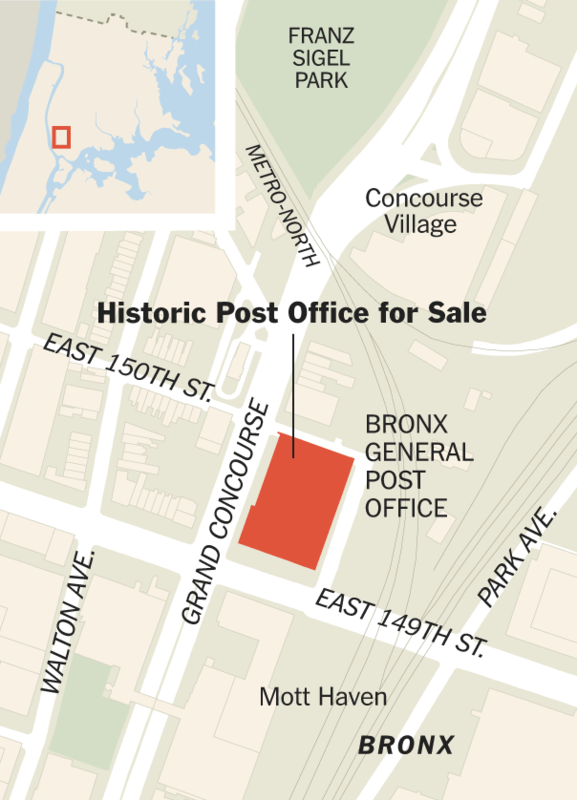 After Sale, What Comes Next for the Bronx General Post Office? The Bronx Post Office is now being renovated by its new owner, Youngwoo & Associates, who plan to open the building up for public and commercial use. All photos by Nathan Kensinger. ]Welcome back to Camera Obscura, Curbed’s series of photo essays by Nathan Kensinger. This week, a look at the future of the Bronx General Post Office. When the U.S. Postal Service first proposed selling off the Bronx General Post Office in 2012, the plan was quickly denounced by politicians and protested by the community. The facility, a New York City Landmark completed in 1937, had become a vital part of the neighborhood over the course of several generations, and residents did not want to see it closed down. But the postal service, facing $15.9 billion in debt, was resolved to sell off its assets, and YoungWoo & Associates and Bristol Grouppurchased the four-story, block-long building in 2014 for $19 million. During the past year, most of its interior spaces have slowly been dismantled, with offices, lockers, and mailboxes auctioned off and hidden rooms and catwalks emptied out to make way for a different future. Inside the Bronx General Post Office today, postal operations are slowly being reduced to a smaller footprint in space the agency has leased from YoungWoo & Associates. In the emptied sections, the layers of history have mostly been stripped away. Bathrooms, walls, and drop ceilings are being removed, revealing enormous arched windows, but the last few artifacts that remain paint a bleak picture of a claustrophobic and micro-managed workplace. A series of leftover signs hangs throughout the complex, offering warnings about a wide range of behavior, including the temptations of mail tampering, the dangers of unsafe footwear, and improper bathroom techniques like toilet paper misuse, excessive loitering, incorrect flushing, and the overconsumption of paper towels. An even more elaborate remnant from this Big Brother mindset is found in a dusty system of hidden ladders and concealed catwalks, which were used by postal inspectors to silently creep from floor to floor. Lurking in pitch black hallways, they peered down through peepholes, surreptitiously spying on their colleagues, who could never be sure when they were being watched from above. Some employees decorated their work stations with personal signage, either sincere religious pleas or commentaries about their fragile mental health. 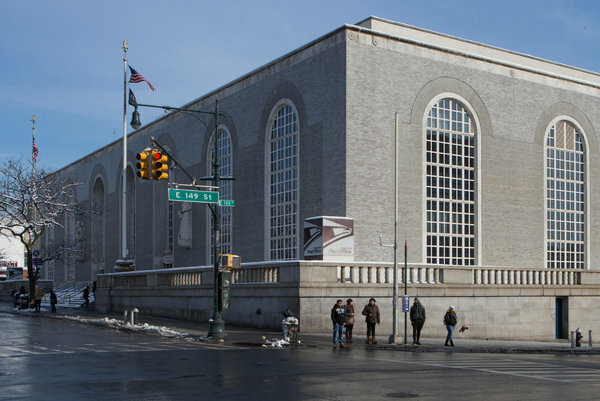 The future of the Bronx Post Office will certainly be sunnier, as its dark interior spaces are illuminated and the public is invited to visit off-limits parts of the building for the first time. “We will be able to open this building up, and make it feasible for people to access it,” said Nebiar. “We’ll be opening up the windows and doors. People will be able to hang out on the promenade.” The fate of the building will also be more positive than that of several New York Landmarks nearby, which have either been abandoned or destroyed. A short walk down the Grand Concourse is the recently demolished P.S. 31, a landmarked 1899 school that the city left to decay for decades, while up the street, the upper floors of the Andrew Freedman Home remain empty and rotting. Further north, the hollowed out Kingsbridge Armory is still waiting to be transformed by its developers and the Gould Memorial Library is seeking millions of dollars for urgent repairs, while to the east, the old Bronx Borough Courthouse has been left vacant by its owner for over 30 years. The Bronx General Post Office was designed by Thomas Harlan Ellett, and “was executed in a style that combines classical simplicity with the sleekness of modernism,” in the words of a NYC Landmarks plaque placed onsite. “The lobby is adorned with thirteen murals depicting the occupations of American workers painted in 1939 by Ben Shahn and his wife, Bernarda Bryson.” The murals were declared a NYC Landmark in 2013 and cannot be removed or altered. Behind the current post office lobby, several large open floor plans are hidden. The entire building is 175,000 square feet, though most of the space is currently empty. Grand windows on the second floor are slowly being uncovered, in an area that will become office space. “The next level up will be small, private offices. The garage area will be retail space,” said Nebiar. Some old equipment remains in the building. “It really was a combination of old world meets new world. They never removed a lot of the stuff that was put up in the 1930s,” said Nebiar. An art installation on the upper level, titled “Hands Around The World,” is one of the cheerier artifacts from the post office’s past. The installation hints at the diversity of the post office staff. Each hand was individually decorated and labeled with a worker’s name. In contrast, a series of warning signs left behind throughout the building suggest a highly regulated workplace. Demolition crews are now removing the last remnants of offices throughout the upper levels. The project is set to open in 2017, and it will be Youngwoo’s first in the Bronx. On the building’s lower level, a windowless recreation room holds an antiquated ping pong table, one of the largest objects left behind by the post office. Nearby, cinderblock workshops and concrete loading docks will be replaced with new streetside retail and a building entrance connecting the back of the building to the lobby, bringing light to this dark interior. In one dimly lit workshop, the post office left behind another friendly warning to employees, this time about the dangers of stealing or tampering with the mail. When the building was offered up for sale, just 40 workers remained. “You know, every building has a story to tell, but sometimes that story changes with time and with people and with culture,” said Nebiar. For the original article and photos please click here. On October 8, 2015, the Art Deco Society of New York rallied support for the Coney Island Pumping Station at the Landmarks Preservation Committee Hearing. The Art Deco Society of New York is submitted the following materials in support of designation of the Coney Island Pumping Station as a New York City Landmark. The time has come for you to step up and protect New York’s Deco heritage! This is your one-time opportunity to add your voice to help preserve Irwin Chanin’s only public building, the Coney Island Pumping Station (CIPS), when it comes before the Landmarks Preservation Committee in a few short weeks. Although Chanin is commonly known for his most monumental works, including the Century and Majestic apartment houses and the Chanin Building, the CIPS marked the change in his style from Art Deco skyscrapers to low rise functional buildings used for the common good of all and to celebrate progress and innovation. At the time of construction, the CIPS was praised for being a creative alternative to the typically classical designs of other municipal buildings. The building appreciates the mechanization of the 1930s world at large and responded with architectural and industrial designs that reflects the attitudes of the Machine Age. The beauty of the CIPS and its use of the Art Deco style makes it significant and irreplaceable as one a great example of Art Deco architecture in New York City. Let us know if you plan to attend the Landmarks Preservation Committee hearing on October 8th and we will notify you as we receive more details. Make sure your voice is heard by Friday, September 25th. These few minutes of your time can help advocate for the preservation of one of our city’s great Art Deco treasures before it is lost forever. To learn more about the CIPS’s important history in New York click here. Many thanks for your support in preserving an important part of New York’s Art Deco history. Please don’t hesitate to call us at 212-679-DECO(3326) with any questions you may have. Our friends at Landmarks West! have alerted us to these two important initiatives that need your support! You care about the future of New York. most directly involved with shaping our city. Last December, the LPC planned to “de-calendar” nearly 100 sites across the city, removing them from consideration as potential landmarks and ending the protections that come with that consideration. Among the buildings to be removed – without a public hearing – were the former IRT Powerhouse (see above), St. Michael’s Episcopal Church (with windows by Louis Comfort Tiffany), the Pepsi sign in Long Island City, Greenwood Cemetery in Brooklyn, five Broadway theaters, and early 19th-century structures in Staten Island. The LPC must consider and take prompt action on heard-but-not-yet designated properties on the merits. To decide the fate of these buildings without public hearings and without reference to merit would be inconsistent with your mandate to preserve and protect New York City’s history. “Our Sky is NOT FOR SALE! In March, the City Planning Commission announced a massive citywide rezoning proposal that would raise height limits across the city and weaken hard-won contextual neighborhood zoning protections, benefiting developers while hurting communities. Do not be misled by promises of affordable housing! The proposed zoning amendments contain no provisions to guarantee creation of affordable housing or any other public amenities. I support efforts to defend the current and future contextual neighborhood zoning protections from being weakened by allowing height limits within these protected areas to be raised by 20-30%. The proposed citywide rezoning plan would overturn communities’ hard-won zoning and historic district protections in one fell swoop. The result would be higher, out-of-character new buildings that undermine individual neighborhoods’ human scale and unique sense of place. This is not the way to ensure affordability, architectural quality, and quality of life in our city. The environmental review for the rezoning plan must be expanded to ensure height limits can be maintained and impacts on historic resources, neighborhood character, and quality of life are taken into account for every neighborhood that will be affected. More information on the plan should be made available to the public, and there should be public briefings in all affected neighborhoods. The Art Deco Society of New York is pleased to share with our members, The Greenwich Village Society for Historic Preservation’s (GVSHP) report that examines some flaws in New York City’s landmarking system, and urges that changes be made to better protect historic structures. The report can be viewed here. According to Andrew Berman, the Executive Director of GVSHP, the report looks at the practices of the prior administration regarding the timing of landmarking properties and the notification given to developers and owners that the Landmarks Preservation Commission was considering landmarking their properties, well before taking any action to protect them. What the report found is that while by far most property owners are responsible, some bad actors are primarily concerned with preventing their properties from being landmarked, and use the long advance warning given to them by the Landmarks Preservation Commission to destroy or compromise their historic properties before landmark designation takes place. As a result, sites designed by great architects, as well as other prominent and less well-known structures throughout our city, have been destroyed or altered before landmark designation could take effect. Current law requires that property owners be notified in advance of any vote by the Landmarks Preservation Commission to calendar their building for potential landmark status — a step which simply means that the building is being formally considered for landmark designation and will come before the Commission for a public hearing before any decision is made. Calendaring gives the commission a 40-day buffer within which they can chose to designate a property before demolition or alteration permits can be granted. This ensures that a property owner is made aware in advance of their property being considered for landmark designation, so they or any member of the public have the opportunity to provide information or comment to the Landmarks Preservation Commission before any decision is made, while also ensuring that the Commission can move to landmark a property before it can be demolished or compromised. However, in recent years the Commission has begun the practice of letting property owners know that they are even thinking about considering their properties for potential designation weeks or months before any calendaring vote, thus giving bad actors advance warning to seek and secure demolition or alteration permits before the Commission can take action to protect the building. This extra-legal process, as well as the Commission’s sometimes slow pace in designating buildings or districts once calendared, has allowed many historic properties being considered for landmark designation to be compromised or lost. GVHSP hopes the new chair of the Landmarks Preservation Commission and our new mayor will consider a more careful approach. Property owners must by law be notified of any potential action under consideration by the Commission, and certainly should be. But the current practices of the Commission, which go well beyond this, give bad actors too much opportunity to get around the law and subvert the landmarking process. For four decades, Ella Michael has walked through the doors of the Bronx General Post Office to stock up on stamps and ship holiday presents to family and friends in Georgia and South Carolina. For a while in the 1980s, she came with letters for her son who was serving in the United States Army in Germany. But Ms. Michael will soon lose the big post office that has been her connection to the world. The Postal Service is moving forward with a plan to sell the historic Bronx building despite protests from many of its customers, community leaders and elected officials, who view it as a neighborhood institution, a place where people come to transact the daily business of their lives. The sprawling 1935 building, which anchors a corner of the Grand Concourse and East 149th Street, is a grand public space lined with 13 museum-worthy murals by the artists Ben Shahn and Bernarda Bryson Shahn. “It’s not just a post office, it’s part of my life,” said Ms. Michael, 68, a retired accountant who often walks the nine blocks from her apartment to the post office for exercise. “If they take this away from me, what am I going to do? The post office has called for offers from prospective buyers as part of a larger sell-off of historic properties across the nation. The financially strapped service has said that it wants to reduce its infrastructure and operating costs as more customers turn to electronic communications. The volume of mail delivered by the service has been shrinking steadily from a record 213 billion pieces in 2006. Steve Hutkins, a New York University professor who started a blog to oppose the sales (savethepostoffice.com), contends that these grand post offices are an irreplaceable part of history and belong to the public. He said that many of them, including the one in the Bronx, were built under Franklin D. Roosevelt’s New Deal programs to help instill local pride and inspire confidence in government during the Great Depression. “To sell off these buildings is really to undo the work of the New Deal,” he said. The Bronx post office employs about 40 people and occupies a four-story building with more than 150,000 square feet of space, leading Ms. Chirichello to call it “severely underused.” She noted that as the Postal Service proceeded with the sale, it was taking steps to ensure that the historic building and murals were preserved. Ms. Chirichello said the Postal Service would consider all offers and declined to discuss any specifics about them or the value of the property. She said the call for offers would help assess market interest and be followed by a formal request for proposals outlining the service’s sales requirements. Ms. Chirichello emphasized that the service planned to relocate its retail operations, which include providing mailboxes for 1,900 customers, to another site in the Bronx. But some customers said that it would not be the same. Preservation of Art Deco and Moderne structures in New York is important not only to protect the legacy of those design movements, but also to support community efforts to maintain these buildings as useful locations that everyone can enjoy. The Moderne landmark Parkchester Bow Tie American Theatre is a great example. Built in 1939 for the once-thriving Parkchester neighborhood of the Bronx, Loew’s American Theater was opened on December 26, 1940. Sadly, the American Theatre eventually fell on hard times. You can help preserve this 1930s Art Moderne landmark theatre, which was recently closed without public notification or input, leaving residents without the theater, arts, history, or entertainment that the theater had been providing for the Parkchester, Bronx, community for over 74 years. Join Michelle J. Alleyne, who has started a petition to Bronx Borough President Ruben Diaz Jr., Mayor Bill De Blasio, former Mayor Michael Bloomberg, New York Assemblyman Louis R. Sepulveda, City Council Member Annabel Palma, Bronx Community Board District Manager Francisco M. Gonzalez, and New York Sen. Ruben Diaz Sr., to keep this theater an enduring part of the community. We need you to contact Senators Kirsten Gillibrand and Charles Schumer by Thursday, July 25, and ask them to support the Historic Rehabilitation Tax credit. The Senate Finance Committee is working on a comprehensive tax reform proposal, and may eliminate this crucial preservation tool if it does not receive support by this week. The Historic Rehabilitation Tax Credit, which encourages the reuse of income-producing buildings, has spurred $106 billion in rehabilitation projects and 2.3 million jobs nationally. New York State has seen some of the greatest activity. Last year there was nearly $1 billion in rehabilitation, and the State Historic Preservation Office estimated there would be $1.5 billion this year. Projects ranging from the Apollo Theater, to the Williamsburg Savings Bank, to 70 Pine Street have benefited from this tax credit. The Historic Rehabilitation Tax Credit has been an enormous help to the State’s economy and must be preserved. Please support it and ensure that New York will continue to benefit. encouraging new development in Midtown East puts City money invested in Hudson Yards and Lower Manhattan at risk. The full Boards of CB 5 and 6 ratified the task force vote and was expected to submit their resolution to City Planning on July 1, at the end of the 60 days they had for review. Other Boards are expected to formally support them. The zoning proposal will then go to Manhattan Borough President Scott Stringer for his 30-day review. If you agree with the task force, please write the Borough President at sstringer@manhattanbp.org.